This month's inspiration: Trees, Trees, Trees! I made this card for Gingersnaps Holiday Happening. These trees are from Ann-ticipations, and I have used them for Fall cards too.I sponged on Stormy Sky Distress Ink and colored the trees, masked my moon. 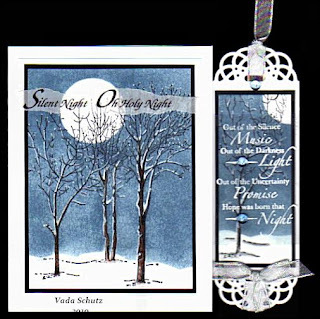 Using my white gel pen I added the snow, and from vellum I printed out “Silent Night. Hope you enjoy it, thanks for stopping in. 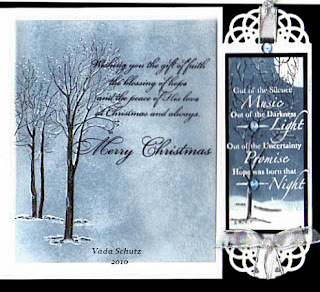 Vada, this is such a beautiful winter scene! It looks so realistic, even the touch of snow on the trees! I can't believe what you did to the inside of the card! Both pieces are stunning! These are stunning, Vada! Love the moonlight you've achieved with the white gel pen - the scenes are so serene - and I love the bookmark sentiment, too. Stunning tag and card! Love your highlighting! Such a stunning card. I just finished a bookmark, too. I love the edges of yours--is that a punch? It looks fantastic. Vada, this is so wonderful. the bookmark just makes it all the more amazing. i'm inspired! Great cards, love how you have added the white using a gel pen. Thanks for sharing some beautiful pieces of art. WOW Ms. V!! What stunning beauties! Of course that's your style!